Look, we're not saying smoking is good, but tobacco can confer the superpower of breath so toxic it keeps away spiders. Take a quick breath and come meet the tobacco hornworm, a caterpillar that has managed to hijack a plant's defense system for itself. Nicotine is a poison—in fact, poisonous enough to use as a pesticide and poisonous enough to use for murder. That's why tobacco plants bother to make nicotine in the first place: to keep insects less industrious than the tobacco hornworm from chomping on its leaves. (Interesting, isn't it, that humans have created a whole industry out of drugging themselves with nicotine, a social exposure to plant toxins.) 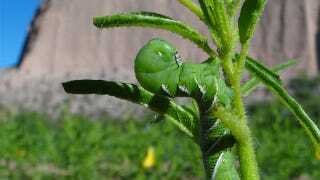 To eat nicotine-filled plant leaves, tobacco hornworms first need to safely get rid of the poison in its waste— but it also keeps some of the nicotine as a special, nasty surprise. In a paper published this week in the Proceedings of the National Academy of Sciences, scientists identify a interesting gene with a rather uninteresting name: CYP6B46. The gene lets the caterpillar take nicotine from its gut and put it into its hemolymph, or the blood-like fluid of an insect's circulatory system. The caterpillar can then open breathing pores along its body and spray out nicotine, like a puff of the e-cigarette. Cool party trick, but it gets better. The scientists also noticed that caterpillars raised on low-nicotine tobacco were surviving in lower numbers. Nicotine breath protected the caterpillars against predators, such as the wolf spider, which shrunk back at the toxic breath. Photos courtesy of Pavan Kumar.